Some of my favorite things to make and eat for breakfast are crepes and pancakes. I've been almost completely avoiding making them though because we made the switch to stainless steel cookware for the health of our family (doesn't help that I'm pregnant and was seriously craving some). 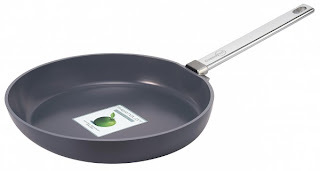 We previously used non-stick Teflon coated cookware, but after learning just how toxic it is, I wanted to avoid it altogether. I love my stainless pans, but guess what? They are impossible to use for high heat frying and yummy things such as pancakes. Unless you want to put a quarter cup coconut oil in it. 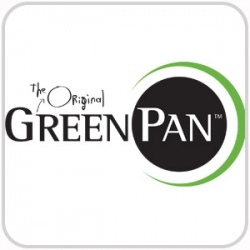 I've been finally rescued by GreenPan - a perfect non-toxic non-stick cookware solution that will not poison my family! We received a 9.5" Copenhagen Open Fry Pan and I am completely smitten by the results, to put it mildly. It has been just over a week since I received it and I already made pancakes, crepes, an omelette, and did some basic sauteing in it. What was I thinking before?! This pan is a dream come true, I can finally make delicious breakfasts without having to scrub a pan for an hour afterward and without having to scrape off a burnt on mess on my stainless pan. Everything just slides right off. Even without any oil. Great news for folks who are trying to loose weight and even better news for those who like flavorful food. What I love is that whatever oil I use when I choose too - it all ends up in the food, it doesn't stay on the pan. That's great for me because I'm trying to gain weight! So easy to clean, I'm in awe! No scrubbing! Perfect strawberry topped pancakes! They took a lot less time to make and resulted in zero frustration. The omelette I made? Simply the best flavor ever. Even though I didn't have a cover that fit the pan, the one I used was loosely placed on top, it was ready in 5 minutes less than my usual omelettes. I had to call my husband and show him the jaw dropping slide-off-the-pan maneuver with a virtually spotless surface left. The 9.5" Copenhagen Frypan can be purchased on Amazon for $71.99 with free shipping. It's certainly a pricey pan, but I am telling you it is totally worth it. Something worth saving for if you can't afford it at the moment. A perfect gift for your wife (or gourmet husband) this holiday season! I would take this any day over jewelry and diamonds. This is something you'll be using everyday and it will be the envy of your other pans. There is also a slightly more affordable option with GreenPan Rotterdam Frypan . SO COOL!!!! I have switched over to all cast iron and stainless steel and sometimes hate the amount of oil I have to use, but wanted to avoid the nasties normally found on non-stick pans! Thanks so much for this info on this product! Def will check it out! Does it still work? All the reviews online say that these pans work great at first and quickly become more stick than standard stainless steel pans.